Today is a huge day, with many important events occurring throughout the country. In addition to Tea Party-led protests against the recently uncovered pattern of maliciously partisan actions by the IRS, today is National Press Day. 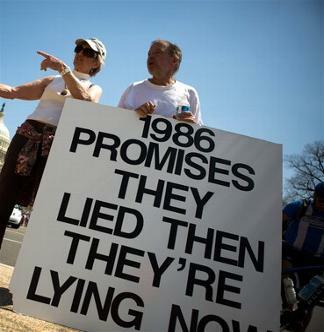 Sponsored by Remember 1986, an organization dedicated to stopping our government from repeating the mistakes of the past, the series of events occurring later today will hopefully serve as a guide to those who wish to harness the justifiable anger and contempt they feel towards Congress for a supremely productive purpose. Namely, preventing the Gang of Eight and their allies from gutting what remains of American immigration law. As we’ve described in previous posts, there will be press conferences held by local immigration enforcement activists throughout the Tri-State Area. However, there will also be an event taking place in California-ground zero for the devastation wrought by an unchecked policy of open borders-in front of the office of Senator Dianne Feinstein, one of the chief political instruments of the gradual, yet seemingly inexorable, decline of the Golden State. A decline that will only be accelerated once this latest amnesty is implemented. Those patriotic Angelenos who still harbor some hope for their state can find information explaining how to attend this event below. Join the individuals who administer and enforce this nation’s immigration laws in opposing this potentially ruinous piece of legislation. If we don’t speak out, who will? DEFEAT the Senate amnesty bill S. 744! Bring American flags and signs opposing Senate Bill S. 744 – Signs will also be available. Talk Show Host – Father of high school football star Jamiel Shaw Jr., executed by an illegal alien gang member. This entry was posted on May 21, 2013 at 2:43 AM and is filed under News. You can follow any responses to this entry through the RSS 2.0 feed.